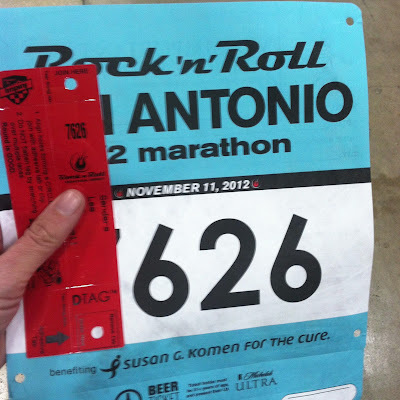 One of my best friends is from San Antonio and she encouraged me to run the San Antonio Rock 'n Roll Half. We made plans to drive down from Fort Worth together and stay at her friends house. I would run the race and she would cheer me on along the sidelines. About a month before the race, I confessed to her that I hadn't been training like I should have been and I probably wasn't going to run this race. I hadn't yet registered and the pricing structure was at the top tier (i.e. most expensive). 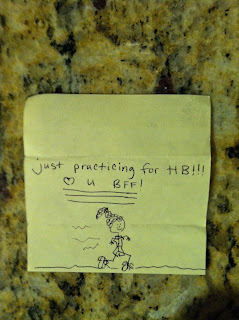 In the way that best friends do, she somehow convinced me that I could do it anyway. 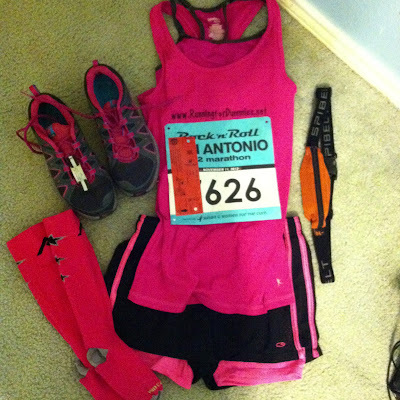 I ran exactly three training runs in preparation for this race; an eight mile, a ten mile, and a 12 mile run. Due to my lack of proper training, I decided I was going to run this slow and comfortably and put any thoughts of a new PR out of my head. My goal was to have fun and enjoy it. I admit I still had fantasies of miraculously achieving a PR anyway. I was already coming up my blog post title, "My Accidental PR!" 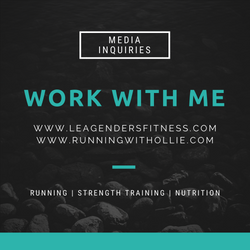 "How I got a new PR without even training!" You can already see that my blog title boasts no such things. We rented a car and drove down first thing on Saturday morning. What kind of car doesn't have a functioning iPod plug? This was very distressing. 99% of the fun of a road trip is the music. We listened to music through my iPhone speakers and complained about it for no less than the first hour on the road. In case you were wondering, listening to the radio was not an option. I was worried about so many things. It started with a sore throat mid-week and a hacking cough was starting to develop. There were thunderstorms in the forecast and my monthly friend was visiting (apologies to my male readers for TMI). This was going to be a disaster! I approached this race a little differently that usual. First of all, I decided to run this race naked, i.e. without GPS watch or music. Why? My GPS watch died during my last training run and it felt completely freeing. Since I wanted to run this race slow, I knew running by feeling, rather than pace was important. 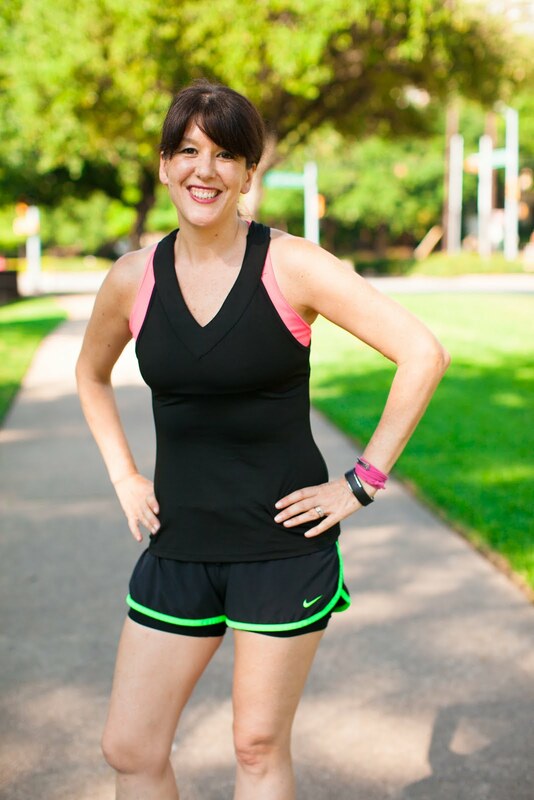 I wanted to dedicated each mile to a different person that I love in my life, and I knew that the music, which can be motivating for pace, can also be very distracting when trying to focus on my thoughts. I left my iPod and GPS watch at home in Fort Worth so I couldn't change my mind at the last minute. 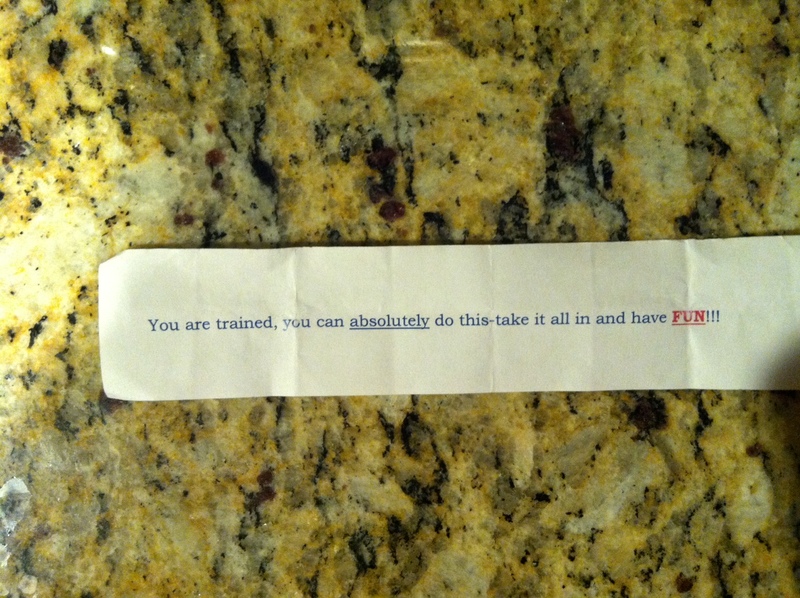 I asked five close local friends to write me a short motivating note before the race. I put the notes in my running belt with plans to pull one out and read it each mile towards the end of the race. As tradition, I laid out my race clothes the night before and took a picture. Once we got into town, 6 hours and (around) 2 major car accidents later, we had to get to the Henry B. Gonzalez convention center to pick up my race packet. 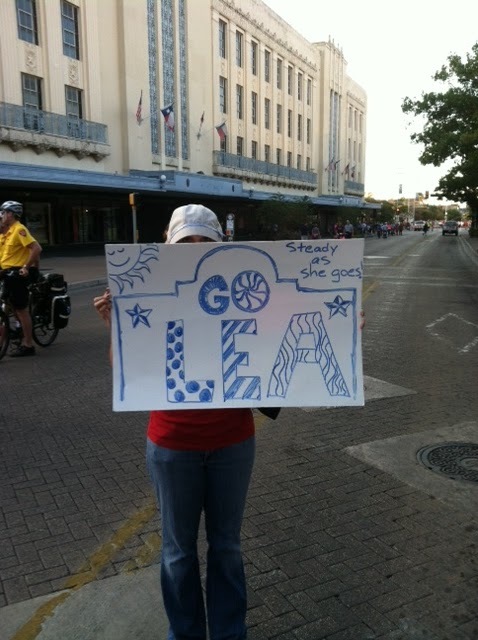 Besides the race, there were several other events happening in San Antonio that week-end, so traffic was very congested. My friend dropped me off to drive around the block while I picked up my race bib. There technically was not a drop off spot in front of the convention center, so I literally jumped out of a still-rolling car. Maybe I thought she was going to come to a complete stop, but she didn't. HA! 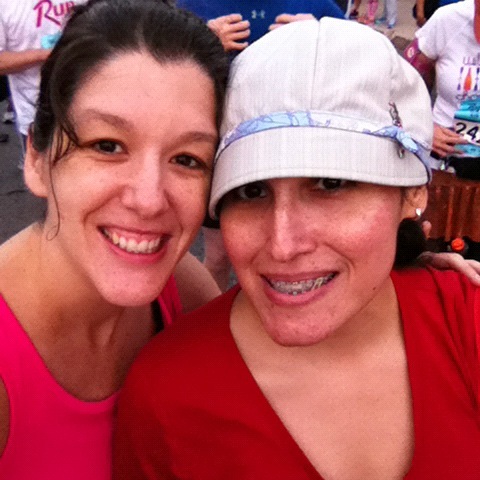 I managed to pick up my packet and come back down to the street before my friend could make it around the block. After a carbo-load dinner of Olive Garden pasta the night before, we were just exhausted! I was ready for bed but we remembered we needed to go to the store so that my friend could make a motivating sign to hold up along the sidelines. Her genius friend had a poster board that she had painted with dry erase paint. This would be awesome! My friend could change the sign at different points along the course. I went to bed at 9:30 in prepared for a 5 am wake time, but instead was up until at least 1 am with a hacking cough and newly developed stuffy nose. After I finally fell asleep, I woke up no less than once a hour before the alarm. At 5 am, I seriously considered not going. I was tired, sick and very worried. I pushed forward. We drove all the way down there, I paid all this money, I had to do it. I just reminded myself that this race would be slow and I could walk if I needed to. A little sick but at the starting line with my biggest supporter! I teared up during the star-spangled banner. I have no idea why I was so emotional. That has never happened before. It must be the sickness. I stood near the 2:00 pacer at the start line. I thought I would try to keep up with him if I could without taxing myself. I absolutely could not exert myself. Within the first mile I knew it wasn't going to happen. If I was healthy, I could have done it. I was not. I had to run slower. At mile three I was feeling OK, after passing the Alamo, I saw my friend for the first time. I ran up and gave her a big hug. I liked my sign. It made me smile and gave me a boost. We had planned ahead that she would be standing at mile 3, mile 8 and mile 12, so I knew to pay attention to the crowds and look for her. It was nice mental break, because instead of counting miles down to the end of the race (i.e. 10 more miles to go) I was counting to the next time I would see her, five more miles until I see Cathy again! 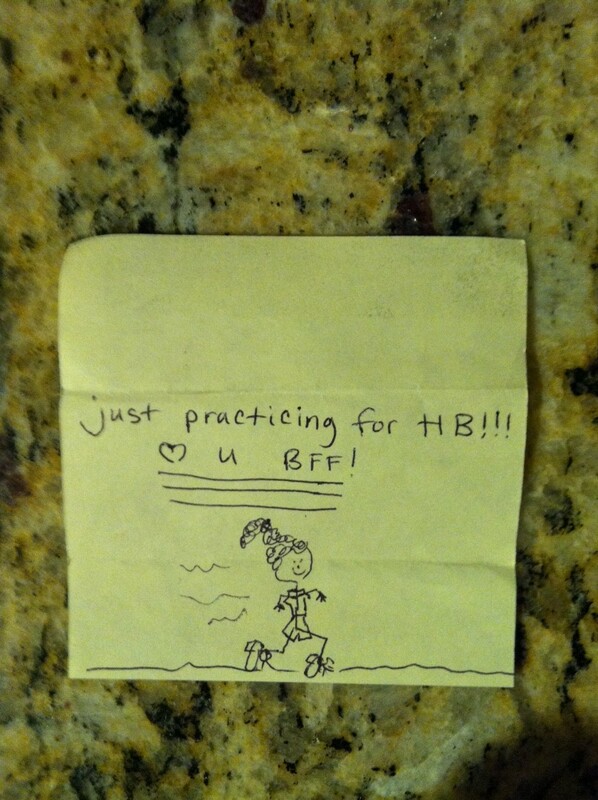 At mile five I started to read the motivating notes that my friends wrote me. While I still think it was a great idea, execution was a little shaky. At one point while trying to pull out the notes while running, I dropped one on the ground and had to turn around, bend down, and pick it up. The risk of a trampling seemed real. 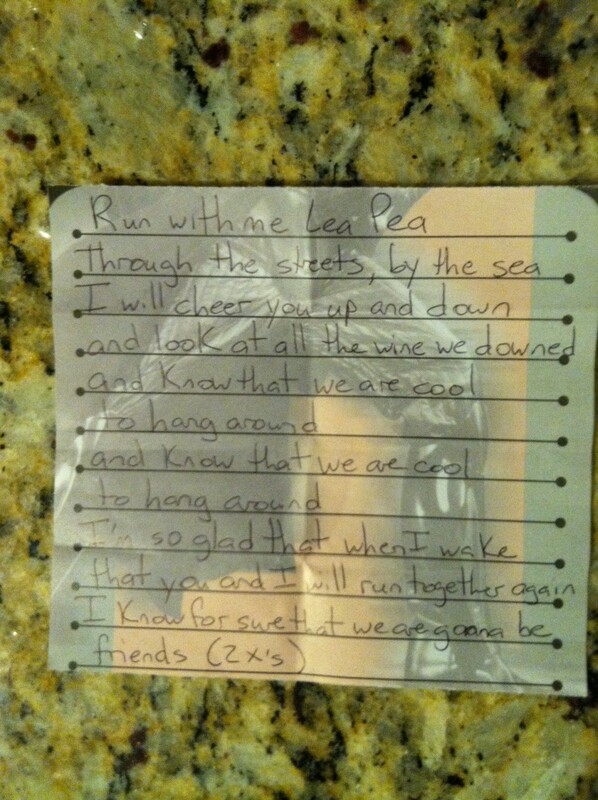 I decided that from then on, I would walk for a few seconds and get the note out, read it, and then continue running. "You are trained, you can absolutely do this - take it all in and have fun!!!" At mile 8 I saw my friend again with a new sign! After a big hug, I read another note. "You Paid $100 for this sh!t Move it sister!" I decided to dedicate each mile to someone that I love. At first it was each member of my family back home, then one to my friend Jen who passed away. Once I started reading the notes, I would dedicate the mile to the person who wrote the note. It was amazing how quickly the mile passed when I was focusing on praying for and being thankful for these wonderful people in my life, rather than focusing on the pain of running 13 miles. I cried emotional tears several times during the race. "Just practicing for Huntington Beach"
Dry Erase Poster Board Rocks! 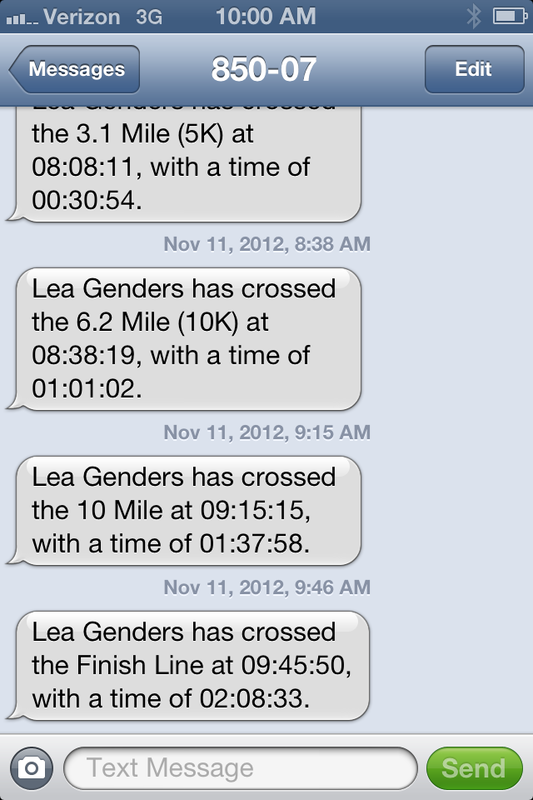 My throat didn't bother me at all during the race and by some miracle, I didn't cough at all. I ran a comfortable pace which felt slow to me, and besides the few seconds each mile it took to get the notes out, I didn't walk at all. At about eight and half minutes slower than my half marathon PR, I actually finished feeling pretty strong! 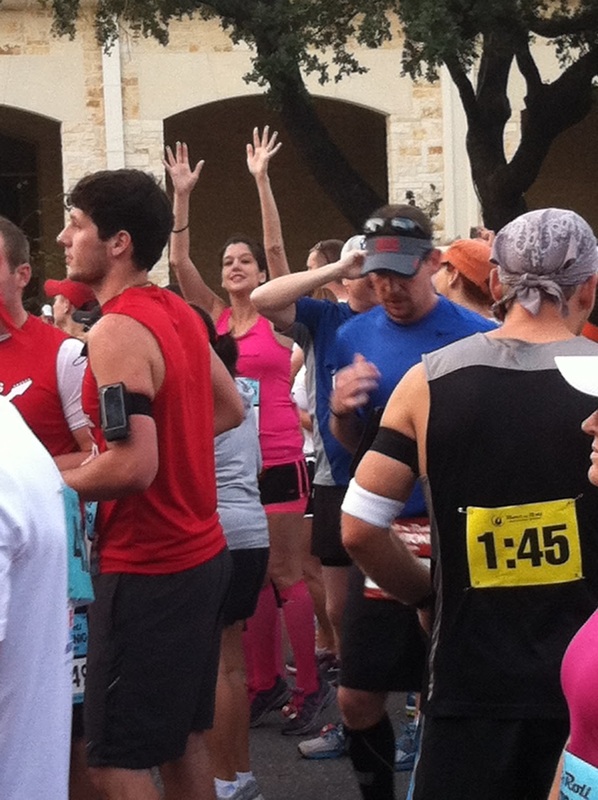 This race gave me the confidence that if I slow my pace, I can run a full. Despite being sick, physically and mentally this was one of the easiest half marathons I have ever ran. Not a PR by any means, but not too shabby for a sick person! 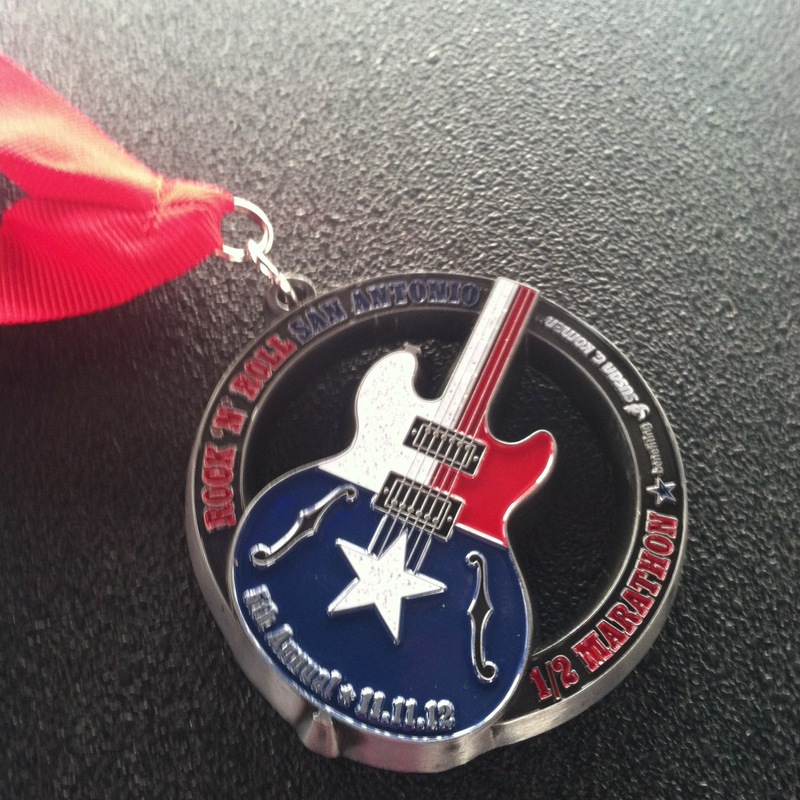 I ran Dallas earlier this year so this was my second city in the Rock 'n Roll race series this year. Have you ever run a Rock 'n Roll race? 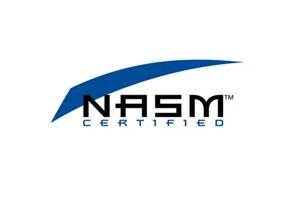 I am considering Nashville in April 2013. So I ran this race sick. I'm not sure if that means I am dedicated or just crazy. Maybe a little of both. 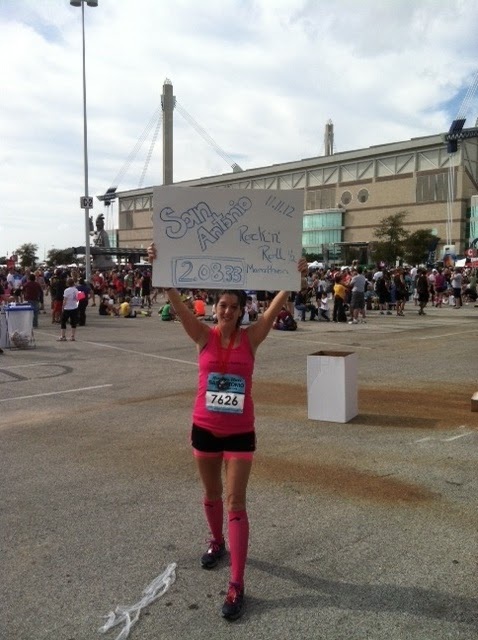 I ran my first half last Sunday, did train a lot, wasn't at all sick and my time was no where near yours, lol! But I had fun so I'll take it! :-D Congrats on running it!! I do have an RnR scheduled for Pittsburgh in August 2013. Can't wait! I'm planning my first half for next year! 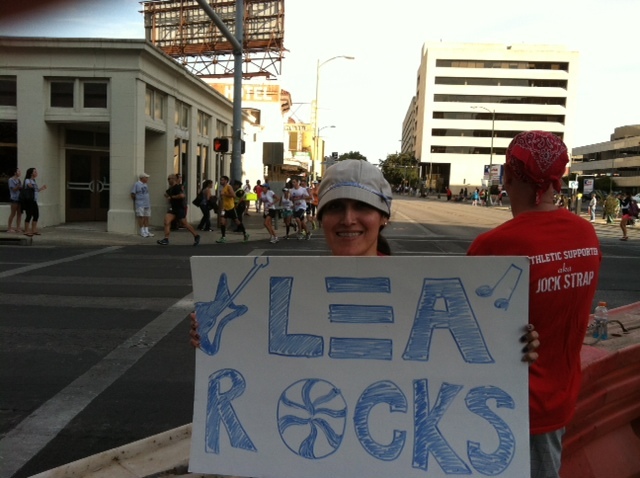 You're such an inspiration, Lea! I ran the San Jose Rock and Roll 1/2 on 10/7. Tons of fun. PR'd at 3:04 (my 3rd 1/2 of the year...my life). 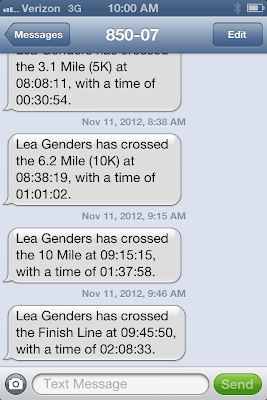 My 1st I did in 3:11 :) Happy for you Lea! You did wonderfully! congratulations on your PR!! Great job!!! Great recap! 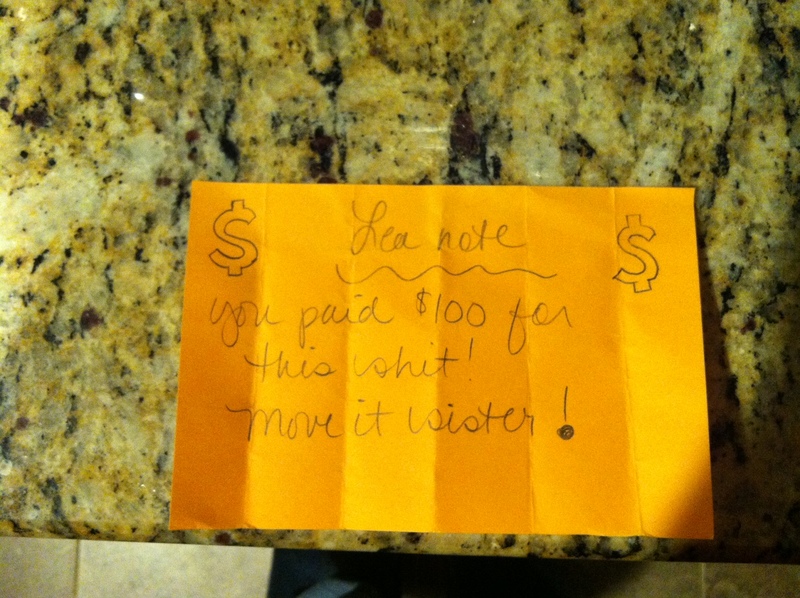 I loved your idea of the notes. I've found that running actually helps clear me up if I'm sick, but then again, I live in the humid southeast so I think the climate acts as sort of a humidifier. I have only done one half so far and it was a RnR. I LOVED it, it was the best race I have ever run - from crowd support to personal performance... everything was awesome. And hey! Since you have done more than one RnR this year you get a special medal! Wait! I didn't get a special medal! Was I supposed to? Congrats on your first half! I agree the r 'n r series is a really fun one! Those notes are a great idea!! Sorry to hear that you were sick and worried, but I'm so glad everything turned out alright. :) Congrats! I just did the Disney Wine and Dine half this weekend and decided not to run for a time but for fun and take photos along the way. It was a magical run and I am glad I did it this way. Runs like this help us remember why we love to run! I loved that friend who was waiting with the poster. What a great idea and the notes too! awww your friend with the posters and notes is so awesome! I would never think to pass out notes! very cute! I'm new to your site and I've been reading up on a bunch of your entries :) I've been running since Aug. 2012 and I'll be running my first 1/2 in April! I was wondering...that shot you had of the texts with your times...is that something that went out to everyone you wanted to know? Is that something special the race does or can you do it for any race? Your time amazes me - sick or not!!! The Rock 'n Roll races series does it, I think other big races may do it too. It cost $5 for 5 people to update, then $1 for each additional. I didn't have 5 people to send it to, so I sent the extra one to myself...I still haven't deleted those texts from my phone and I ran this back in November! lol. It's remarkable to go to see this web page and reading the views of all friends regarding this article, while I am also eager of getting familiarity. Thankfulness to my father who told me concerning this weblog, this webpage is actually amazing. My website is in the exact same niche as yours and my visitors would really benefit from some of the information you provide here.